You get bang for your Bevo buck! Poor Arpeggio. The location has been a revolving location for restaurants that has ranged from Stix’s Bistro to Terra Burger to the now present Arpeggio Grill. It has been hard to keep up with rent on the Drag as the economy drags, but students keep pouring in. Rent has always been killer on the Drag and is even more present this year with the prominent closings of quite a few businesses like the clothing store Wish and the bookstore Intellectual Property in 2009. The Daily Texan actually focused in on it in early August. However, the owner of Arpeggio Grill seems to be taking lessons from his predecessors and I feel like the owner is ready for the Drag. Arpeggio Grill knows we students want good food at a location near us and a place that doesn’t have to look like a dump to give us a good deal. That’s why so many other restaurants on the Drag have been staying around and I think this restaurant could do the same. Approaching Arpeggio Grill, the restaurant face has huge windows that lets in light to what could be a cramped space. 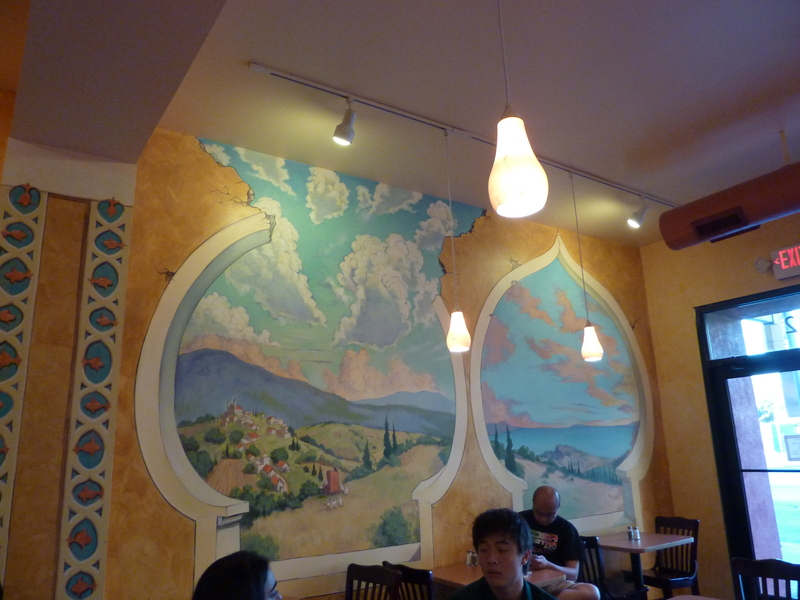 Murals of Arabian Nights decorate the walls and bring a kitschy, but nice atmosphere to the place. Arpeggio is noticeably a little better for small groups as the smaller tables are pushed to the wall and can be uncomfortable for parties larger than two. Our large group of ten had to split between two tables in order not to block the passageways between tables. The lighting is warm and inviting and everything is kept rather clean. It’s a place you can go and have good food that doesn’t look like a hole in the wall. There are many, many choices available to try at Arpeggio. 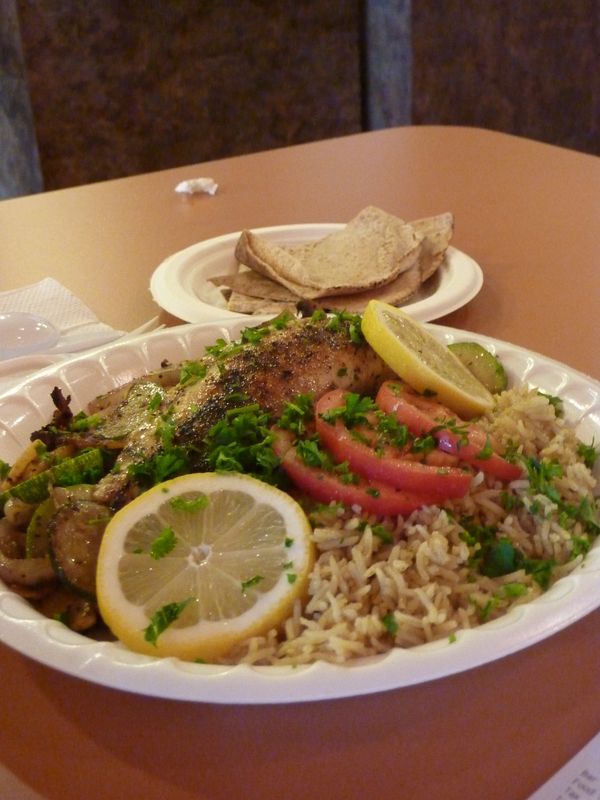 First, there is the Mediterranean side that has all sorts of foods like falafels, kabobs, and baba ghanouj. On the other side is another sort of mini-restaurant in the place called Tomato Shack that serves Italian food. Basic pastas are available as well as a good variety of pizzas. No one tried the Italian food, but it looked like it might be a fair deal if one was dying for some Italian. Personally, for myself, I wanted to try as much as possible so I got the Arpeggio Mesa Platter. 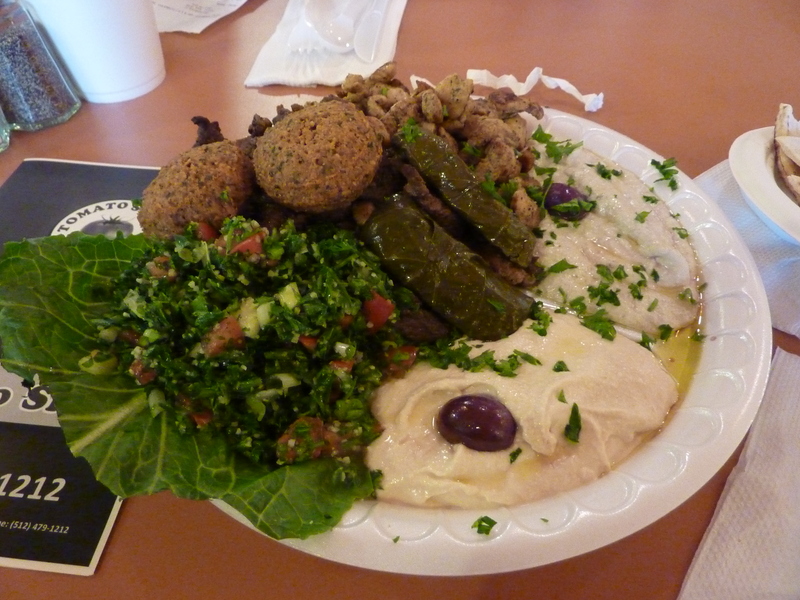 The platter contains a little bit of everything Mediterranean and is apparently a popular choice. It was this huge Styrofoam plate full of different kinds of food. There was the beef and chicken shawerma, both nicely seasoned. Then there was the rice, which was also well made and not too spicy. The hummus was good. It was really quite smooth and had a distinctively sour taste. The tabouleh was a little spicy and tasty. Very fresh. The dolma was yummy, but a tiny bit on the soggy side. 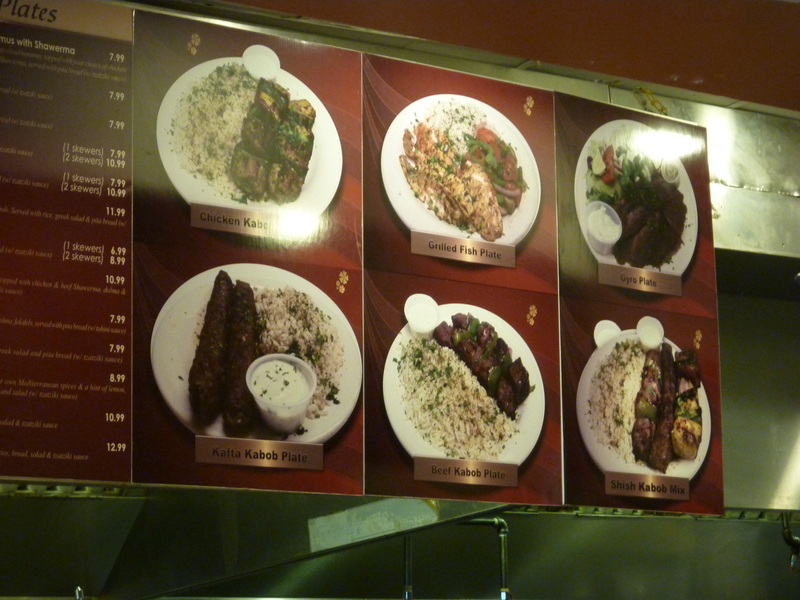 The baba ghanouj (the brown meatball-looking objects in the first picture) was also quite yummy, but very spicy. I think the platter was a great choice for trying a little of everything and everything was well seasoned and tasted right. In general, everyone found the food pretty yummy. You get a really good deal with the decent prices for tons of food so definitely recommended! Between our large group, we had the chicken, falafels, shawermas, grilled fish, steak, and special platters and no complaints about dinner choice. Everyone seemed to enjoy themselves and it’s a place we would like to go back to. The people were definitely very nice and the place seemed quite clean. There’s a white board with special deals and a menu in the back with pictures if you have no idea what you want.The guy calls out the number at the bottom of the receipt and brings the food to you. You might want to save yourself trouble and order to-go since you can still eat it there. Afterwards, it looks like I barely touched the plate, but I came away with a very full stomach and enough leftovers for two meals. I think Arpeggio Grill is accomplishing its goals of providing tasty food for good prices to college students on a budget. Arpeggio Grill is right on the Drag, close to campus, so it is a convenient place to stop by and fulfill your Mediterranean craving. 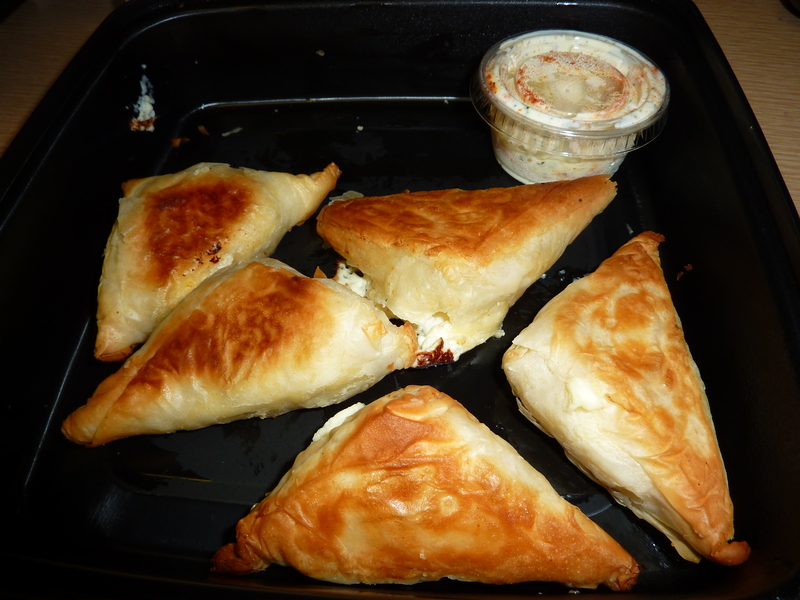 Grab a pita and some hummus or a falafel to go, Arpeggio Grill is a great place to grab a meal with leftovers to boot. Rating: 😛 😛 😛 😛 1/2 for tasty food at decent prices, tons of food that will surely provide leftovers and makes the price even better for your Bevo Bucks! One lonely Sunday I was scouting for a new place to eat for dinner. It’d been a while since I had tried someplace new so I finally decided to look for some good Greek food near campus. Now, I know Milto’s has competition in the way of Kismet Café and the new El Greco, but Milto’s isn’t only a Greek restaurant. Far from it. I decided to give it a try and here is the result. All right, all right. The food did taste good. Little greasy, but it was decent. On my way there, I was busy trying to decide whether to brave it out and eat alone or do take-out. Immediately, when I got there, I decided take-out was the way to go. I don’t know if it was me chickening out or the fact that the restaurant was rather dark, but I decided that I did not really want to eat there that day. From the outside, Milto’s looked like a nice family establishment and inside, it was really just like a family establishment. Not fancy, but homey and a good place to sit back and talk to fellow diners. In the dark. OK, OK, it wasn’t that dark and I didn’t get to explore the other side rooms they had, which are really nice if you want to have a more private dinner or be a little louder that day. Milto’s is a friendly restaurant, albeit a little small, that lets the diners order at the counter and pick up the order (dine-in or take-out) by using a little announcing speaker and a little service bell to notify customers to pick up their order. I headed straight to the counter to put in my order. Getting my take-out at Milto’s, I was impressed by how nice the guy at the counter was. I am not a very loud person, but he took the time to try to listen to my order and was patient when I was trying to order the tyropitas. He did get a little confused about my wanting pesto cheese bread too, but I decided to let it go and let it be part of my trying the Italian food they have. I also ordered souvlaki since I had come for Greek food and I was told to wait and my food would be out soon. I decided to sit at the small table by the pick-up counter and watched guests go by as I studied for classes. First off, I was surprised by the emptiness of the restaurant at 6pm, but it was a Sunday and students probably were trying to stay as far away from campus as they could. Soon after I ordered, though, tons of people came, but they were mostly older folks who didn’t seem to be students and families. Quite a few people ordered take-out and another woman soon after me also sat at a table nearby to wait for her food. I noticed the décor of the place now and noted how the restaurant was one of those simple take-care-of-yourself restaurants with even paper towels provided on each table as napkins. Milto’s is an Italian restaurant as well and looking at their pizzas, there are two kinds: Sicilian pizza and Neapolitan pizza. The Neapolitan pizza is your usual round thin-crust pizza, but the Sicilian pizza is a much thicker crust and is more square/rectangle-shaped. Pizzas seemed quite popular and each type of pizza was ordered rather equally. However, if you’re looking for good ol’ New York pizza, I’m afraid you’re out of luck. Try Hot Slice down the road. Nearly every person who ordered got a Greek salad. Really. Next time, I am definitely getting a Greek salad. There was even another lady talking to her friend in line saying how the best thing there was the Greek salad and she was eating there almost every week. When the salad came out, I’ll admit, I didn’t see anything out of the ordinary with it. However, it did look quite fresh with tomatoes and dressing and an interestingly shaped roll on top. It is sort of a brown swirl that accompanies the salad and I presume is quite tasty. I waited for my food for over half an hour, but I guess I asked for a lot (tyropitas, pesto cheese bread, and souvlaki), the stuff wasn’t what they usually make as I could tell from the people who ordered, and I was ordering take-out. However, I do feel like I waited an awfully long time because even the woman who ordered after me got her food first and left. Eventually, I got my food, but if I ever eat there again and order out, I am definitely calling ahead. Finally, back with the goods, I proceeded to take pictures of my food and eat. I finished everything over the course of three days because I guess I wasn’t that hungry, but here is the run-down. The tyropitas were yummy, but quite different from the Greek food I’m used to during the Greek festival in Houston. 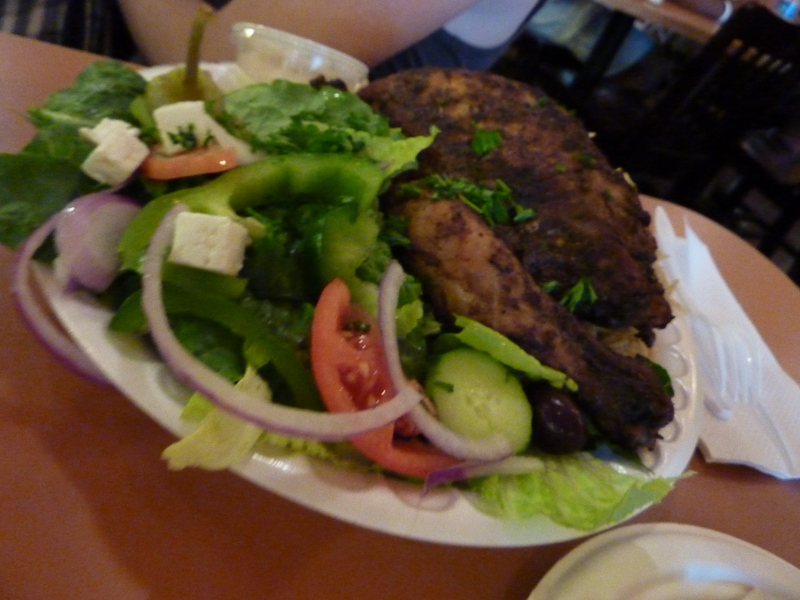 If you like real Greek food, I would not recommend Milto’s for that. The phyllo dough was not flaky enough nor buttery enough and the cheese didn’t seem to taste quite right. The cheese seemed to be a mix of cream cheese and feta cheese and definitely more cream cheese than feta. The fact that cream cheese is inside just doesn’t seem right. The cream cheese was also very salty and though the tyropita does tend to be salty, this one seemed overly salty. Though the tyropitas were not what I was expecting and not worth the price, it did taste good dipped in the tzatziki sauce provided and the sauce was good. 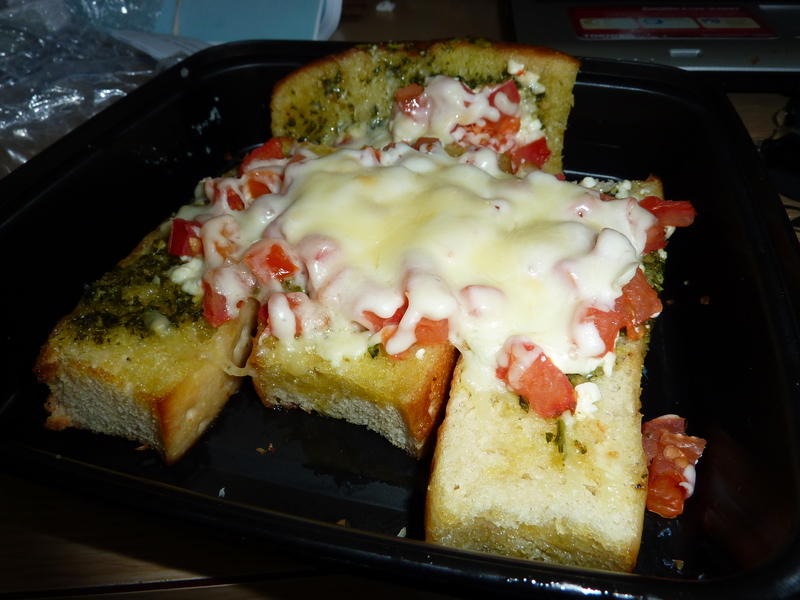 The pesto cheese bread was also pretty good reheated. It smelled good and had fresh tomatoes chopped on top, but the cheese and pesto did not seem very unique or tasty and the best recommendation I can give for it is the thickness of the bread. Finally, the souvlaki was also a little disappointing and, again, not really worth the price. It was just a few pieces of not very flavorful meat put into a pita and provided some tomatoes and onions to eat with it. The real flavor of any souvlaki dish is the seasoning of the meat and this just did not cut it. Overall, Milto’s is a decent Italian restaurant from what I can gather, but it is definitely a restaurant supported by its patrons. I would not recommend coming here for Greek food, but I do really want to try the Greek salad now. I think this place is best if you are used to this kind of homemade food or really enjoy the atmosphere of the place. Milto’s is a nice small restaurant, but the food is very ordinary. The prices are a little expensive for what you get and I think the only reason I might come back to the restaurant is curiosity and Bevo Bucks. Rating: 😛 😛 1/2 for having average food, its nice customer service, and expensive prices.